A commercial cargo vessel's historic first arrival at the International Space Station is now set for Sunday (Sept. 29), one week later than originally planned, NASA officials say. 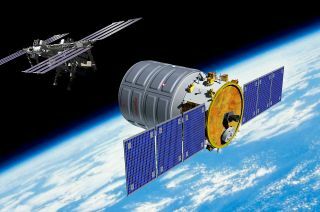 The unmanned Cygnus spacecraft, built by Virginia-based company Orbital Sciences, is expected to be grabbed by the orbiting lab's huge robotic arm at 7:15 a.m. EDT (1115 GMT) on Sunday, with docking operations beginning two hours later. You can watch all the action live here at SPACE.com, courtesy of NASA TV; coverage begins at 4:30 a.m. EDT. The cargo vessel was originally slated to rendezvous with the International Space Station on Sept. 22, but a software glitch scuttled that plan. The delivery of three new crewmembers to the orbiting lab by a Russian Soyuz spacecraft on Wednesday (Sept. 25) also complicated matters for Cygnus, pushing its arrival back further. Sunday's docking will be a big moment for NASA, Cygnus and Orbital Sciences, but it won't mark the first time a private spaceship has visited the orbiting lab. SpaceX's robotic Dragon capsule has docked with the station three times — first on a demonstration mission in May 2012, then on contracted cargo runs in October 2012 and March of this year. California-based SpaceX, which was founded by billionaire entrepreneur Elon Musk, holds a $1.6 billion contract with NASA to make at least 12 such flights. Cygnus is about 17 feet (5 meters) long and 10 feet (3 m) wide. It can carry about 4,400 pounds (2,000 kilograms) of cargo in its current configuration, but the spacecraft will deliver only about 1,300 pounds (589 kg) on this maiden flight, NASA officials said.